Helloooo everybody. I've had a pretty good week on my first week of school holidays. One thing I've done during this week of awesomeness, is finish my Weetzie bat book! I think it was the most totes awesome book i've EVER read. It's also the thickest I've read. I swear it was more than one billion pages long, but I did it, I read the whole thing, and it felt amazing reading the last word and slamming the book shut, throwing my hands in the air and dancing around the house with the biggest grin on my face. I just LOVED it. You guys just HAVE to read Francesca Lia Block's Weetzie Bat books. Here is the cover of the book I read. It has all of the five stories in one book. ISN'T THAT JUST THE BEST THING EVER?! Ummmmmmm, lets think. Oh yeah! Did you guys know that the new No Doubt album is out now, liiiiiike RIGHT NOW! OH MY GOSH! I can't believe they're back together. I bought it with the pocket money that I got from cleaning up the house with my mum. So I am glad to say, that this is the first album, I have bought with my own money. *people clapping and cheering* Yaaaay! My mum told me that I should always remember the first album that you buy with your own money. I took that seriously, and planned to spend my birthday money on the new No Doubt album but obviously that didn't happen, I spent it on perfume. Gwen Stefani Harajuku Lovers perfume. Of course I don't regret it, I mean at least I could remember my first perfume I ever bought. No Doubt has a new music video out, TWO actually. But I haven't seen the other one and I can't be bothered right now, maybe later. But you guys can check it out. The video clip is called Push and Shove. Ya'll should check out their OTHER new video clip, Settle Down. It's totes awesome and I'd totally like to make those rad pants she's wearing. 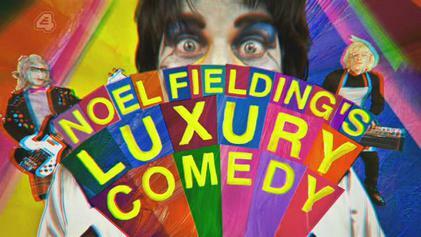 Another thing i'm addicted to right now is Noel Fieldings Luxury Comedy. We found it the other day, and bought it and added it to our collection of other crazy Noel fielding stuff. It's hypnotising us, we're walking around the house singing "Oooh Yeeeaaah," over and over. Me and my brother keep on pointing at each other saying " Ha, big cat pants." Oh god, what weirdo's we are. Recently I have been into Haysi Fantayzee and their unforgettable song, Shiny shiny. I could listen to it over and over. Shiny shiny na na na na. I really like what they wear, that's Vivienne Westwood right there. Ha! that rhymes. Well now that i've finished blabbering, how has your week been?